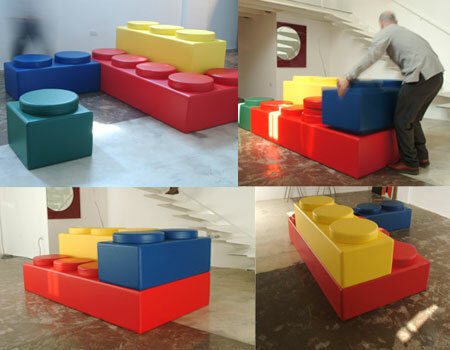 Lego, a popular “brick” toy that every kid likes (even adult also like it) inspired an Italian’s designer came up with a Lego Shape Sofa. This Lego inspired sofa design is called “Bekky”. The sofa is made with foam and rubberized component. It works exactly like Lego component, you can assemble the pieces into different style. In term of “comfort” sitting on “Bekky”; Well… from the picture it doesn’t look comfortable. I guess it’s good and attractive to placed in Office waiting area, but not at your home, unless you have a huge guest waiting area at home. As mentioned before “Bekky” is designed by an Italian from a firm calll NoMadeDesign.